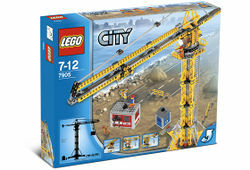 7905 Building Crane is a City Construction set released in 2006. The set contains 721 pieces to construct a large crane, along with an office room and small toilet room, both of which can be lifted by the crane. The crane can rotate 360º, and the trolley can slide along the boom. This set was included in the Product Collections set 66194 City Super Pack. This is the first and only City set thats for ages 7–12. This is a description taken from LEGO.com. Please do not modify it. Tower above the construction site! Build the tallest buildings ever with this special edition LEGO City Building Crane! With working functions straight out of real-world construction equipment, this towering crane is ready for any challenge. The extra-wide base provides stability for lifting loads and the side ladder allows construction workers to climb to the very top! Includes 2 containers, 3 mini-figures, barriers and more. Crane stands a towering 26" (68cm) tall! Arm extends up to 26" (68cm) long! Turn the crank to lower and raise the working hook! Slide the hook dolly along the arm for precision lifting and lowering. Seat the worker at the controls atop the tower. Crane rotates a full 360. Containers have loops on top for picking up with crane hook! Divided into sub-models for easy building and instant play. Facts about "7905 Building Crane"
Tower above the construction site! Build the tallest buildings ever with this special edition LEGO City Building Crane! With working functions straight out of real-world construction equipment, this towering crane is ready for any challenge. The extra-wide base provides stability for lifting loads and the side ladder allows construction workers to climb to the very top! Includes 2 containers, 3 mini-figures, barriers and more. Crane stands a towering 26" (68cm) tall! Arm extends up to 26" (68cm) long! Turn the crank to lower and raise the working hook! Slide the hook dolly along the arm for precision lifting and lowering. Seat the worker at the controls atop the tower. Crane rotates a full 360. Containers have loops on top for picking up with crane hook! Divided into sub-models for easy building and instant play. This page was last edited on 9 February 2019, at 22:51.